Life has been a rough ride for Nanda Kishore and his family. The 17-year-old has been fighting blood cancer since March. It started with a fever and extreme weakness, then he started fainting. Initially, he was too scared to tell his family that he was losing consciousness, but when the episodes became more and more frequent and his fever continued to worsen, he told his grandparents what was happening. 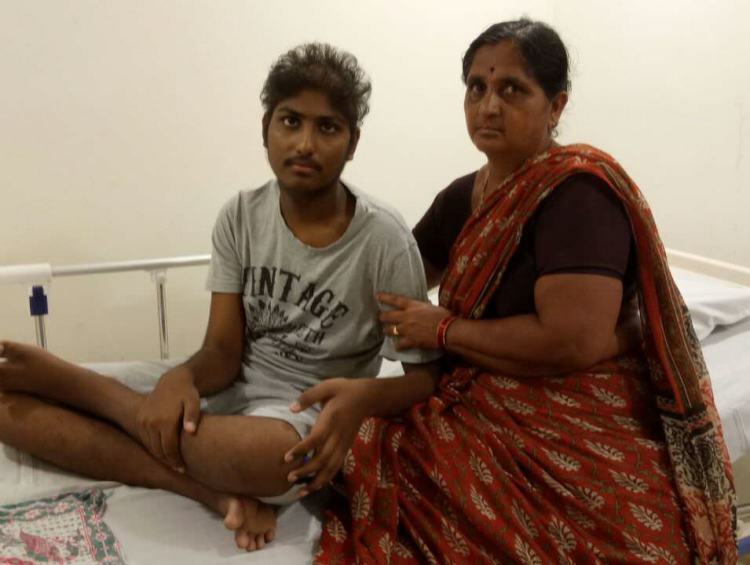 When his grandparents took him to a small hospital in Guntur, the doctors ran a few tests and to the absolute shock of Kishore’s family, asked them to take him back and let him do all he wants to. They said there was no hope for his survival and that he should live his last days happily. Kishore’s grandparents pestered the doctors to tell them what was wrong, and they finally told them that he had leukemia, a form of blood cancer. Initially, they were all in denial about his illness. But within a day, they had started enquiring about which hospital has a shot at treating him. 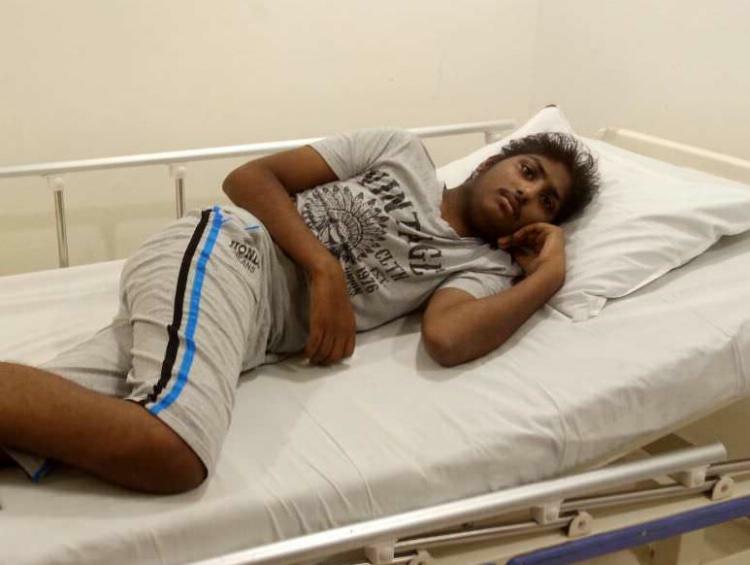 The doctors gave them a list of names of the hospitals and that is how they came to Manipal hospital in Guntur, where he is currently being treated. This was the second time cancer had come to plague a family member. Kishore’s mother Kalyani had been suffering from cancer for 2 years, from the start of 2016 till the end of 2017. She had to undergo rigorous treatment and umpteen chemotherapy sessions to battle her disease. It was harder for her because she is almost completely deaf and mute. She can barely speak and when she does, all that comes out of her mouth is incomprehensible guttural sounds. For her to deal with cancer and come out of it alive was a nightmarish ordeal for the entire family. 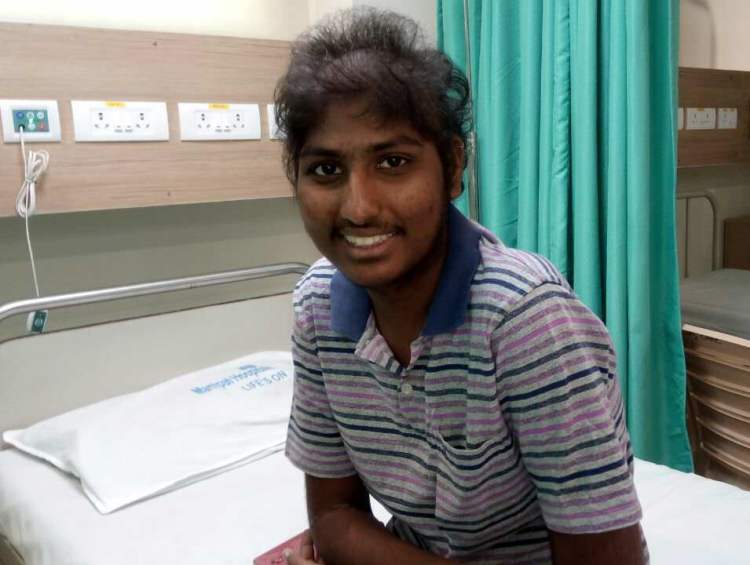 Even before cancer, life was not kind to Kalyani. Owing to her disabilities, her husband abandoned her and their 2 children when Kishore was just 3 years old. He forcibly took whatever little property Kalyani’s father had, and went ahead to marry another woman in the village. Since then, Kalyani has been living at her parents’ place with her children. When he was told about Kalyani’s illness, he didn’t come to even visit her once. He has been equally indifferent to his children as well. When Kishore’s grandfather told him about Kishore’s cancer, he turned a deaf ear to their woes and till now continues to act as if they don’t exist in his life. Kalyani and her daughter Tejasri have been taking care of him, with the help of Kalyani’s parents. 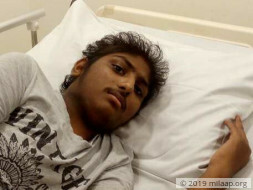 Kishore’s family cannot afford to admit him to the hospital, so they go there every day for his chemotherapy sessions. To make the treatment happen, Kishore’s grandparents rented a small room near the hospital, where Kishore is currently living with his mother and sister. Most of the times his grandparents are there too, to help them out. 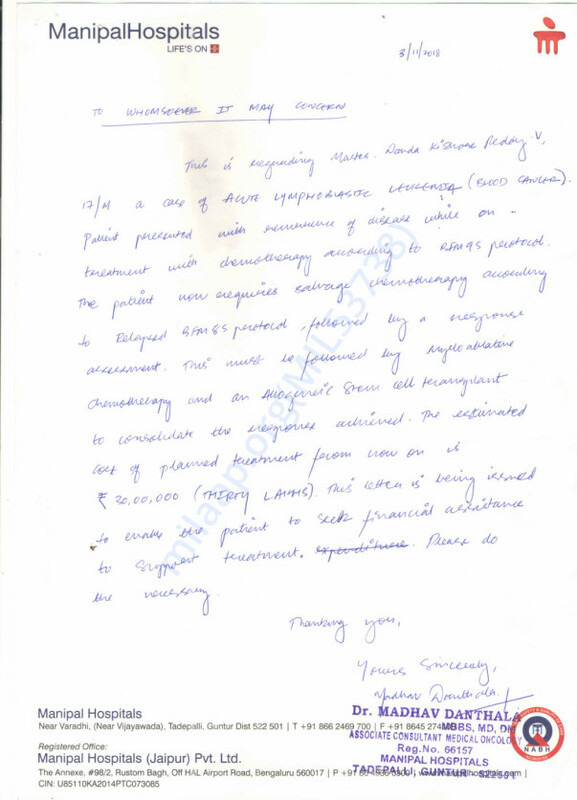 Kalyani’s disability doesn’t allow her to communicate anything to the doctors. Tejasri handles all the interaction at the hospital when their grandparents are not around. Kishore has been brave and smiling throughout this ordeal, but he needs intensive medical care and chemotherapy for an extended period of time in order to recover. His grandfather Kakki Reddy, doesn’t have the money to afford the same. Both Kakki Reddy and Kalyani work as farm laborers for a minimal wage. Their income can barely fill their stomachs with food, let alone affording a treatment worth lakhs of rupees. 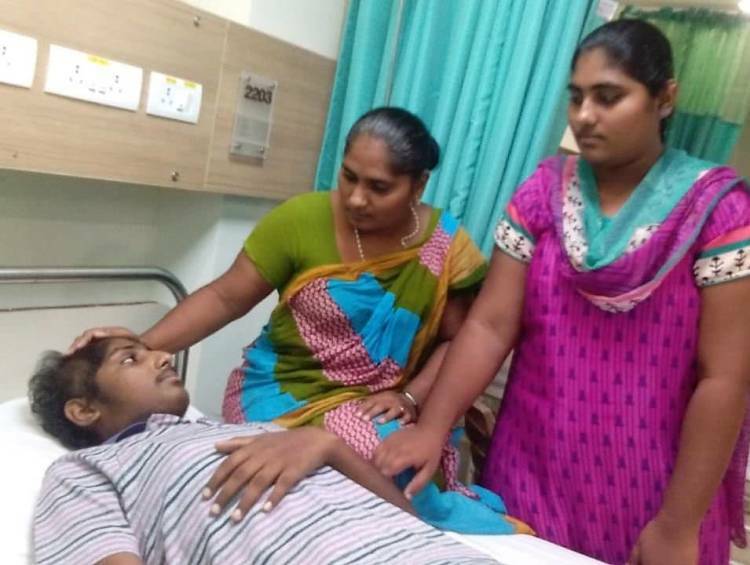 So far, his grandfather has spent over Rs 4 lakhs towards his treatment by borrowing money from their relatives. Now all his sources are exhausted and he can’t pay for Kishore’s treatment anymore. 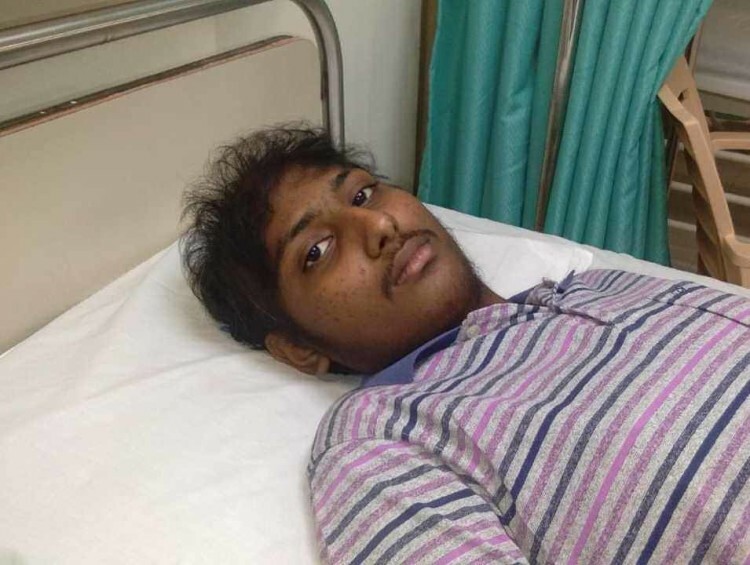 For Kishore to get the treatment he needs, his family desperately needs your help. The smallest contribution from your side will go a long way for them. 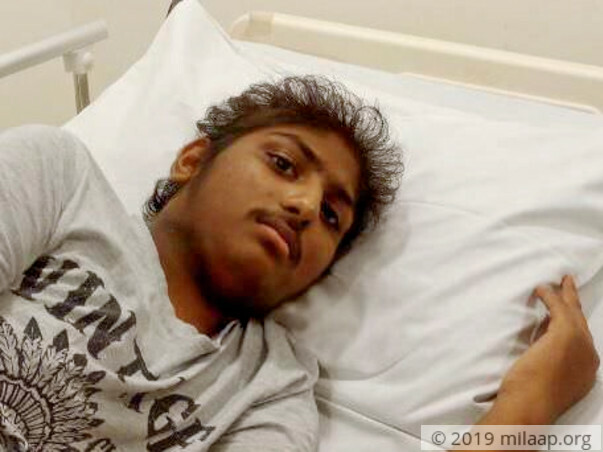 Kishore deserves a second chance at life, and with that, he hopes to make everything better for his mother and grandparents. 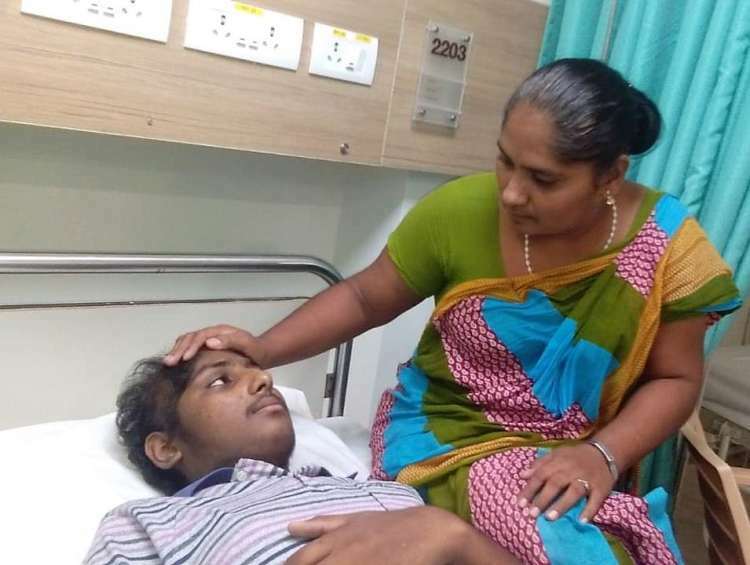 Contribute to Kishore's treatment and help a deaf and dumb mother save her son. With a heavy heart, we regret to inform you that Nanda Kishore is no more amongst us. We will post a detailed update once we get in touch with his family. We request you to kindly pray for his soul to rest in peace. Thank you for the love and support! Please donate and share this campaign! 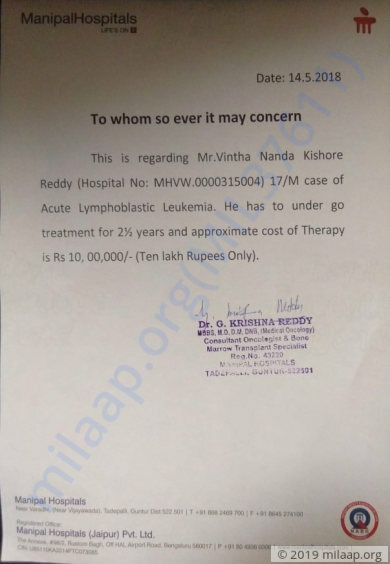 Here's a quick update on Nanda Kishore is going through six cycle chemotherapy which is last cycle of intensive therapy. Once this cycle is completed then he will be taking oral chemotherapy for two years.